I still remember after coming from school or after play time my mom used to make maggi noodles. Sometimes we used to make by ourselves as its very easy to make. When Valli announced the theme" Warm food to beat rain", I thought of making maggi noodles. But then thought why not make something different from this noodles. So here I am with yummy and crispy maggi noodles pakoda. Boil water and add maggi noodles and masala powder. In a mixing bowl add chopped onion, corn, beans, cilantro, besan, rice flour, salt and cooked noodles. Mix well, add very little water if required. Heat oil for deep frying. Drop little quantity of noodle mix into oil to fry. Fry till golden brown or crisp. Serve hot with ketchup. Chop bell pepper, carrot, cabbage and onions into long strings. Add besan, rice flour, salt, haldi, chili powder,curry leaves and cilantro. Mix well. Add little water if needed. Do not make smooth paste of this mix. Heat oil for deep frying. Drop little quantity of the mix into oil to make padoka's. 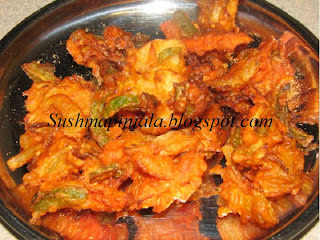 Fry till golden brown or crisp. Sprinkle little chat masala on top before serving. 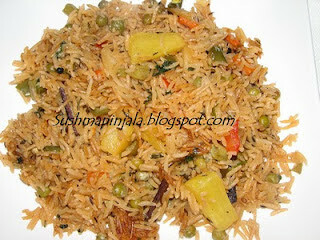 Also sending this recipe to Gayathri's WTMLevent. 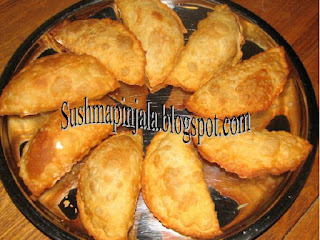 Yesterday I was watching some Cookery show on Indian Channel, then I came across some sweet dishes which are made in Orissa. Its was soo simple and looked soo yummy. 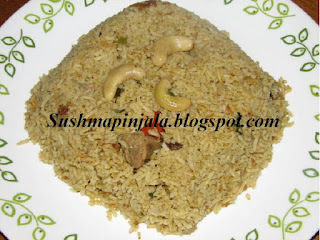 As I was thinking what to cook for day 3 under stuffed food, this recipe looked interesting to me. 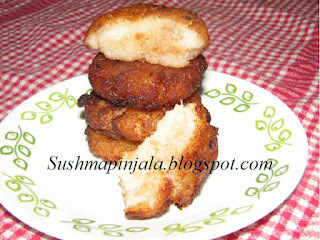 So here I am with the Orissa sweet dish called " Kakara Pitha". This week I will be doing all stuffed food for BM 18. 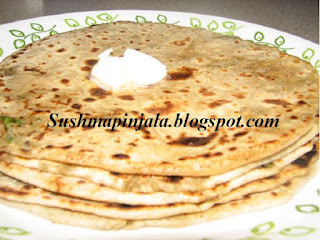 Mooli or radish paratha is the one thing I will planning to make since long time. Radish are of different types. 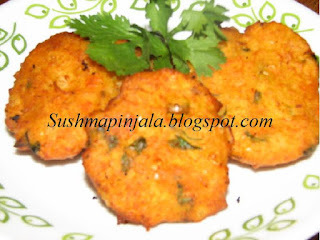 Daikon or white radish is the one which am using to Make these paratha's. Once oil is heated add all whole garam masalas , cashew and raisins,saute for 2 mits. Now add lengthwise cut onions and green chillies. Saute for 5 mits and add ginger garlic paste. Now add all veggies cut into small pieces. Fry till all the veggies are 1/2 cooked. Now add cilantro and mint leaves and mix well. 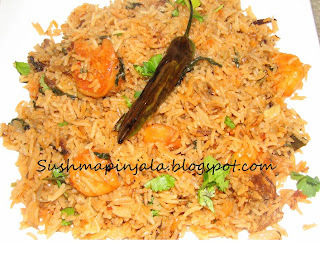 Add washed rice and fry for 5 mits. Now add 4 cups water and garam masala or biryani masala. Add salt and pineapple pieces, mix well. Put on lid and cook on medium flame. Add some more water if required. Do not add too much water. Wash Shrimp and cook in pan till they turn light pink color. Now marinate shrimp with maida, corn flour, chilli powder, haldi, salt and food color. Marinate for 30mits and then shallow fry them till they turn golden brown and crispy. Now heat oil in large pan and add whole garam masala, cashew and raisins. 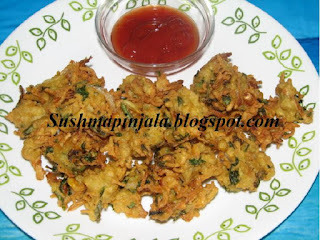 Fry them for 2 mits and then add onions and green chillies which are cut lengthwise. Add curry leaves and ginger garlic paste. Now add chopped mnt and cilantro leaves.